Apple might not completely move away from traditional physical keyboards but at least we know now the company will be trying its level best to improve the functionality of the function keys row that we know as the Touch Bar. 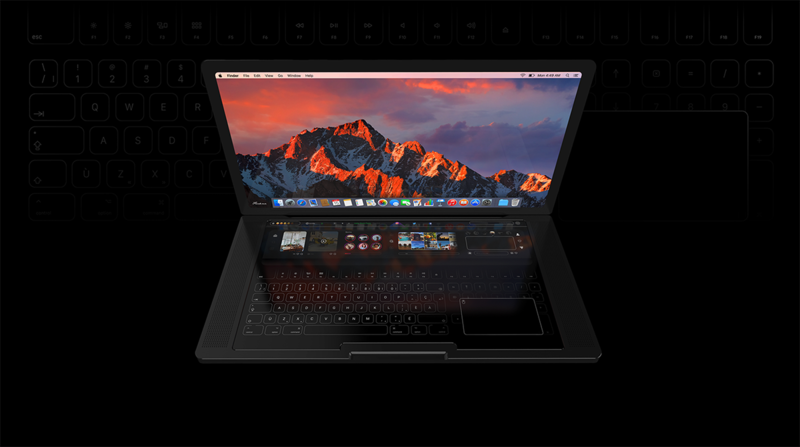 The company has been slimming down its keyboards and minimizing movements inside, and while we wait for a touchscreen keyboard from Apple, a concept designer has already envisioned a MacBook Pro Touch in the latest concept video. Furkan Kasap, who studies Industrial Product Design at the Mimar Sinan Fine Arts University, has created the MacBook Pro Touch concept in which the keyboard has taken over the area currently occupied by the trackpad, and envisaged a virtual trackpad which sits on the right-hand side. The Touch Bar has been relocated just above the virtual keyboard and is shown to have many useful app thumbnails. The designer seems to have given little regard to usability as the trackpad is very small and it is difficult to understand why there are two Touch Bars. Apple has been toying with the idea of virtual keyboards for quite some time. In 2016, a patent emerged in which the company mentioned a Force Touch keyboard which uses a light guide layer to provide light through a series of holes which will be sealed with a transparent sealant to allow light to pass whilst protecting the keyboard from dirt and liquid. Similarly, WSJ has claimed that Apple is working with Sonder to make a hardware dynamic keyboard with customizable e-ink display keys. The biggest issue with a touchscreen keyboard is the simulation of a keypress. Haptic feedback can help resolve this issue and Apple seems to be training us to get accustomed to smaller keyboard movements. Another issue is providing advanced haptics that will simulate the feel of the edges of real physical buttons even when they are not being used. Still, even if Apple has plans to release a MacBook Pro that is loaded with a touchscreen-enabled keyboard, it might be several years before we get to see one in action. Till then, enjoy the latest concept and let us know what you think down in the comments.